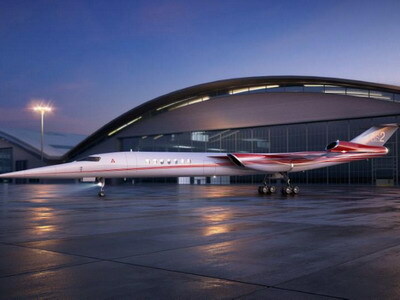 The Aerion SC2 supersonic business jet. Boeing Co said on Tuesday it had made a significant investment in supersonic business jet developer Aerion, as the world’s biggest planemaker looks to tap into rising demand for high-end aircraft that can reduce travel time. The company’s shares touched a record high of $407.48 following the announcement, after opening above $400 for the first time. The jet, the Aerion AS2, can fly at speeds of up to Mach 1.4, or about 1,000 miles (1,610 km) per hour, 70 percent faster than conventional business jets. Lockheed Martin Corp, which announced a partnership in 2017 to develop the AS2, is no longer working with Aerion, representatives from both companies said. U.S. startups Aerion, Boom Supersonic and Spike Aerospace are working to reintroduce supersonic passenger travel for the first time since the Anglo-French Concorde retired in 2003. Supersonic designs have struggled to meet current subsonic noise standards due to engine constraints, but Aerion said in October it would be able to take off and land without regulatory changes in the United States, providing a potential boost to efforts to bring back faster air travel.